Project Background: Underground water Resource in Xinjiang is estimated reaching 115 billion cubic meters, equivalent to the annual water capacity of two Yellow Rivers. 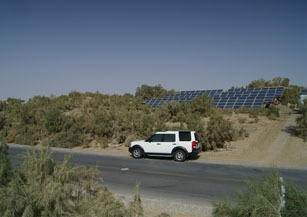 To make good use of these resources can turn enormous desert area to an oasis. 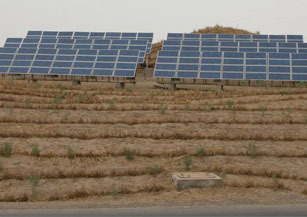 In 2001, Solartech’s Solar pumping system was adopted and applied in the drip irrigation system on sand-resistant forest located at desert highway of Hudson region, Xinjiang Ulgur Autonomous region, China. Solution: By drip irrigation using Solartech Solar pumping system PS9200, it’s able to plant special sand-solidation trees such as Calligonum, strange ammodendron and shrubberies etc. Economic Benefits: The system can generate electricity 27,375 kWh annually, in its 25-year long application, the system can save standard coal up to 257.3 tons, reduce emission of carbon dioxide, sulfur dioxide, soot and ash by 113.2 tons, 5.1 tons, 3.9 tons and 66.9 tons respectively. 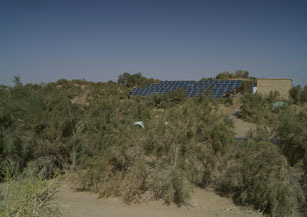 Social Benefits: Solar pumping system can meet the water requirement of sand-resistant forest, desert plants, and medicinal plant. 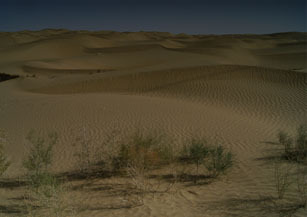 Through providing automatic irrigation water for combating desertification, expanding the area of arable land, construction of green recycling economy can and gradually change the desert to the oasis.